Today’s guest post from our great friend Flatlander, deer hunter, land manager and venison chef extraordinaire. What a meal for the weekend! Hey Mike: It’s time to clean out the freezers again in preparation for the upcoming season and, hopefully, fresh meat. This is a fine way to use up what’s left of last season’s deer. You normally associate venison with jerky, chili and maybe meatloaf, but how often have you served it like some of the finer restaurants in America do? It’s easier than you think. 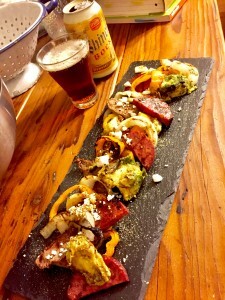 Tapas bars have become a big deal in the last decade–small portions or appetizers if you will of varying tastes and unique recipes beyond the everyday. Why not get a little more sophisticated with your wild game? I’ve recently converted to eating much healthier, less sugar, more food straight from the ground–veggies, fruits and wild game. This doesn’t have to be a boring process; it utilizes the same game in your freezer in a way you’ve probably not considered before. First, if you’ve never grilled venison summer sausage before you’re missing out. This is kind of a spin on the grilled spam that is popular in Hawaii, but even better with some summer sausage with some cheese in it. Just a slight char on the outside gives it amazing flavor. Next, I take trimmings from a deer loin– after I cut the chops, I slice off leftover, paper-thin pieces next to the silver skin, almost like Sushi—and soak them in liquid Aminos, a low-sodium alternative to Soy Sauce. Prep some veggies: onions sliced 3/8” thick; red, yellow or orange bell peppers cut to the same thickness; and an avocado cut into 4 slices. Put all the meat and veggies in a large bowl and toss with olive oil and your favorite seasoning. I use Weavers Dutch Country Farm Dust seasoning, which has everything you need in one shaker. Grill, over medium, all the meat and veggies at the same time. Pull the thin venison strips off first (don’t overcook them!) and the avocado last. Place all meat and veggies on a platter that has been wiped with olive oil and sea salt. Top with either Feta or blue cheese and drizzle with balsamic.